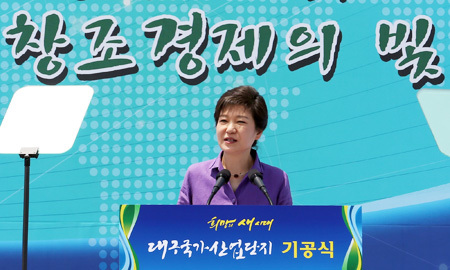 The government will invest 40 trillion won ($35.8 billion) over the next five years to turn Korea into a creative economy centered on science and information technologies as well as small and mid-sized enterprises. Unveiling the master plan to spur the transition, Choi Mun-kee, minister of Science, ICT and Future Planning, said the government’s goal is to foster an environment where creative ideas and innovative technologies lead to new jobs and markets. This year alone, the government will inject 6.9 trillion won, which will includes a 500-billion-won fund for venture start-ups.